Towering over the struggle for the future of Algeria is a symbol of its past. Protesters gather in the shadow of the ornate Grande Poste, or post office - a French colonial landmark in central Algiers. Some say that having broken free of colonial rule in 1962, Algerians are fighting for their independence all over again, this time from a hated and sclerotic regime. Friday is now the main day of protest, when demonstrators occupy the steps outside the Grand Poste, spilling over into the central square in front. The crowd pulses with energy and with hope, but is threaded through with undercover police. Repression is part of the bedrock here. If freedom is about to triumph here, it seems they haven't got the memo yet. Raise a camera or a notebook and they appear within minutes, some polite, others far less so. They demand to see your government-issued accreditation - you can't move without it. They crowd in as you interview protesters, filming them with their phones. The aim is to intimidate those who speak out. Old habits die hard, but are less effective these days. When we started filming a young political science student, Amina Djouadi, so did several plainclothes police. The 22-year old, in a green headscarf, glanced in their direction and kept on talking. "We are not afraid anymore," she told us. "We are young, and full of bravery. The people are heroes." They have already seen off Algeria's veteran autocrat, Abdelaziz Bouteflika. But for Amina and many others here the end of his two decades in the presidency was just the start. They say time's up for "Le Pouvoir" - his coterie of generals, businessmen and ruling party politicians. Among the sea of banners at the protests, there's one with a Brexit flavour. It reads "leave means leave". Amina believes the regime won't push back hard. "If they wanted to fight they would have fought in the first place," she said. It is the young who are driving this protest movement - on social media and on the streets. About half of Algeria's population is under 30. They want a generational shift. "The faces who have been around for 20 years have to leave," said Miriam Saoud, a 19-year old student in a black hoodie and a black headscarf. "We want to elect people to represent us. We want our voices to be heard, and we want everything to change." The next target for the demonstrators is the new interim President, Abdelkader Bensalah, who was a Bouteflika loyalist. He has promised to lead Algeria to free elections on 4 July. Few believe he will last that long. Image caption Protesters want the removal of all the governing elite, known as "Le Pouvoir"
If he and the rest of the old guard remain in place there can be no chance of free and fair elections, according to Mehdi Feloussi, a stylishly dressed young entrepreneur who is a regular at the protests. They committed fraud in the past, he says, and would do so again. "It's like someone who was stealing for the last 20 years and cheating for the last 20 years telling you, 'Please trust me, I will be nice and I will organise a transparent vote.' Everybody knows they will cheat again." How certain are you, I asked? "99.99%," he replied. The protesters have found strength in numbers, but some are ready to challenge the regime all on their own. That was the case with Nissa Imad, a slight, elderly woman. We found her confronting a long line of riot police who tried to block her joining the demonstration. "I told them this is my country," she said. "We have been liberated. Now we are here at the Grande Poste all the time, thank God. I spent the night here. I am an old lady. I am here for the young, for our kids." Nissa's five children are unemployed, like many young Algerians. "There's nothing for the young generation," she said. "No jobs and no houses. They can't get married. We want this whole system to go." 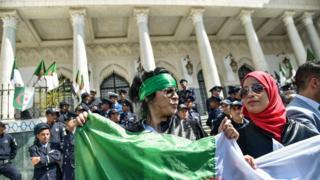 Many come to the protests wearing the red, green and white Algerian flag like a suit of armour. Rabia Ferroukhi had gone a step further, with the colours of the flag daubed on her face. This Algerian woman who lives abroad had come home for a family funeral and then joined the mass protest. "I am very happy to be here with my family to march for democracy," she said, "to stop this corrupt government and try to give the youth a chance for tomorrow. People were very patient for 20 years but now the patience is gone." How far will the protesters be allowed to go? That may depend on Algeria's powerful military. The Chief of Staff, Lieutenant General Ahmed Gaid Salah, has pledged support for the demonstrators. So far so good. But lately he's warned that it would be "unreasonable to manage the transition period without the institutions". To some that's code for preserving the status quo. That statement was "a bit worrying" according to the respected human rights lawyer Mostefa Bouchachi. However, he believes the army will fall into line behind the protesters because they will hold firm. "I think they are going to revise the position," he said. "It's the march of history. I think the Algerians are determined no institution and no person can stop them reaching democracy." Many of the protesters are looking to this veteran campaigner - who is white-haired and softly spoken - to help guide Algeria's transition. With tears in his eyes he paid tribute to those who had taken to the streets. "They gave us dignity again," he said. "We struggled. We tried to do things. We didn't succeed. It is these young people who gave us this feeling of being proud of be Algerians." That pride in the young is shared by a couple with a bird's eye view of the protests. For Karima and Nacer Manser, cries for freedom are now the soundtrack of daily life. The wrought-iron balconies of their elegant family home look on at the Grande Poste. "For the young, this is their shot," says Karima, a teacher, "And they have to take it." Nacer tells us with a smile that the chanting of the crowds is keeping him awake at nights. I ask him if he thinks they will succeed. "We hope so," he says.